Once again, expect a diverse mix with artists hailing from all parts of the world! The acronym N.O.H.A. stands for Noise of Human Art and is the title under which a multicultural group of musicians operates. Noha is also the last name of Phillip Noha, one of the prominent members of this ensemble. Together, the band creates funky beats by mixing drum & bass with a variety of musical sounds and chants from allover the world. Their music is genre bending and defies labels, but people who usually enjoy what falls under the ‘world music’ and ‘electro’ categories should find something to enjoy. This entry was posted in Music and tagged algeria, colombia, idir, japan, music, musical discovery, noise of human art, nujabes, sixto rodriguez, toto la momposina, world music on 28 May 2013 by lapetitelea. We visited the city of Cannes when we lived in the south of France for 4 months. Our day-trip happened in December, way off-season in terms of tourism. This meant that there wasn’t much to do. Cannes is a typical French Riviera town but with more cardboard cutouts of George Clooney and over-sized posters with Marilyn Monroe’s face on sidewalls. Once we’d seen the Palais des festivals and walked around the port, we decided to take a short trip to the island of Sainte-Marguerite. The beautiful, heavily wooded isle, is a 15 minute ferry ride off the coast. It is one of 4 islands which are regrouped under the name of Iles des Lérins. You may have heard of this island before, as it is here that the famous Man in the Iron Mask was imprisoned for 11 years. The fort were he was incarcerated can now be visited as a museum. Of course, when we were there the museum and all other venues (restaurants, hotel) were closed. We enjoyed a nice two hour walk around the pathways which lead us through thick, wooded areas, followed by gorgeous views of the Mediterranean sea. 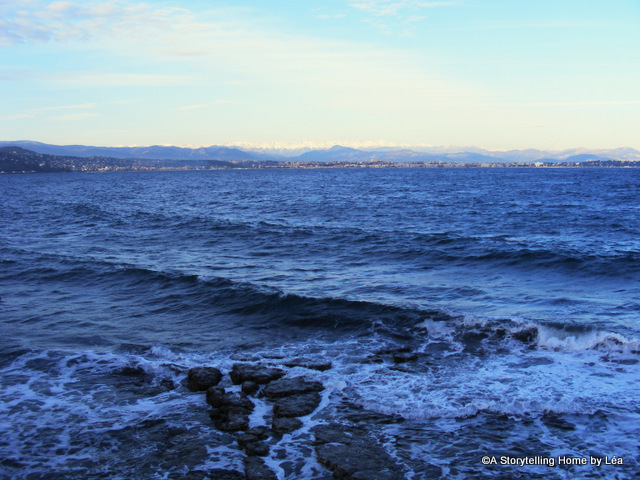 It was all so beautiful that we almost missed the last ferry back to the coast! This entry was posted in photography, Travel stories and tagged cannes, France, france photography, french riviera, mediterranean sea, photography, south of france, travel on 21 May 2013 by lapetitelea. 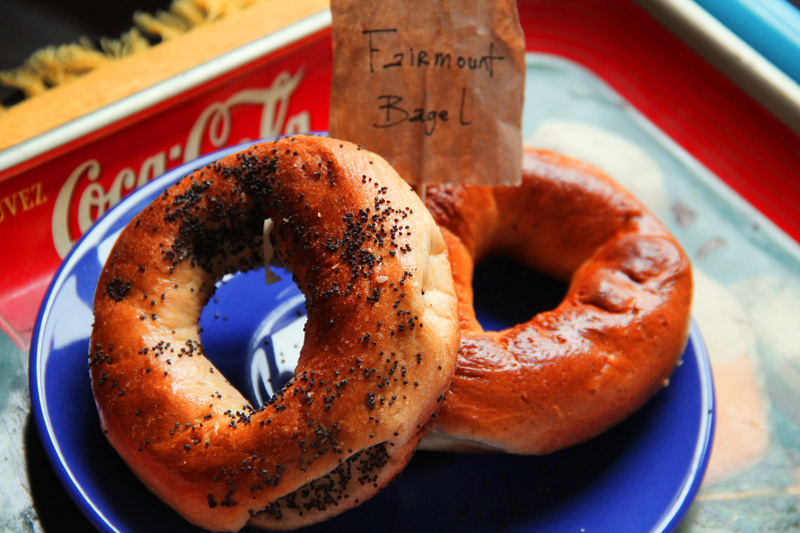 In my latest article for Untapped Cities, I waxed poetic about the one and only Montreal bagel. I was walking on thin ice, writing about bagels on a blog that is based in New York. So far, the debate on Facebook has fallen in the Big apple’s favor, but only because the Untapped readers hailing from the 5 boroughs vastly outnumber those from my town. Obviously, they have never tasted a proper warm Montreal bagel in all it’s sweet and gooey yet crispy glory. If you’d like to read it and weigh in, follow this link. This entry was posted in Food and lifestyle and tagged bagel, bakery, blog, food, montreal, montreal bagel, montreal food, new york bagel, travel on 12 May 2013 by lapetitelea. It’s that time of the year again! As soon as the weather lets us trade our down jackets and giant snow boots for tees and flipflops, most of us Montrealers feel this urgent need to get out of our house. During those short summer months where we can actually stay outside for more than 15 minutes without freezing our noses off, we like to spend as much time as possible outdoors. Alright, I’m exaggerating a little bit about that last part. We do go out in the winter, but there’s nothing like a warm and sunny day in Spring to re-energize us and put a smile back on our face. On Sundays, it sometimes seems like half the city’s population is in a park. 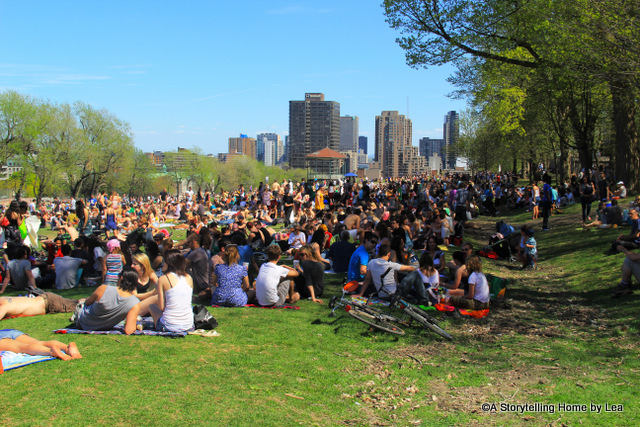 The most popular one is Mont-Royal park(and the adjoining Jeanne-Mance park), a great place to have a picnic, do some hiking, hop on a bike and enjoy beautiful views of the city. 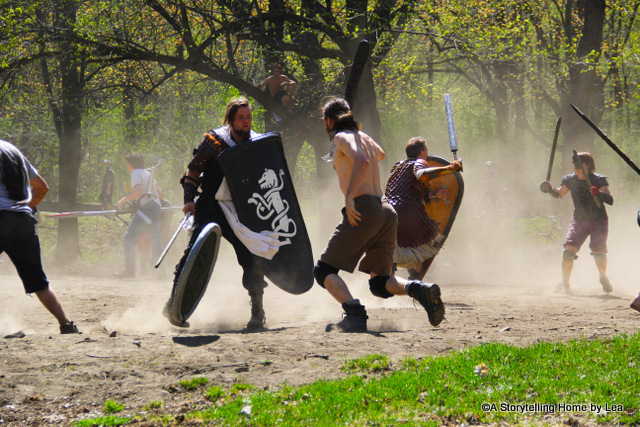 People also gather here for two very unique activities that are held each and every Sunday from April to October. 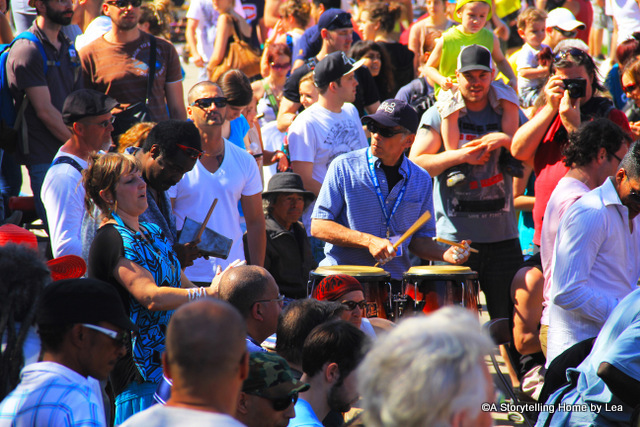 Every summer since 1978, hundreds of people have met at the Sir Georges Étienne Cartier sculpture to hold a giant drum circle. It’s hard to know exactly how many drummers take part in the jam session, but if you count the numerous dancers and simple onlookers, it can go up in the thousands. A little bit higher up on the hill, a group of people calling themselves the warriors of the mountain meet up to hold friendly combats. They fight with foam swords, so not to actually hurt each other. Nevertheless, their battles are to be taken seriously! This entry was posted in photography, The outdoors and tagged canada, mont royal, montreal, outdoors, park, quebec, spring, summer activities, summer montreal, travel on 6 May 2013 by lapetitelea.